Front 1/2 - Scarlet seal's fur subst. Tie in small bunch of fibres of GP tippet. Tie in both tinsels. Carry thread forward half length of body. Wind flat tinsel to make rear half of body. Tie off. Use scarlet fur as dubbing to build up front half of body. Tie off 1/6 from eye. 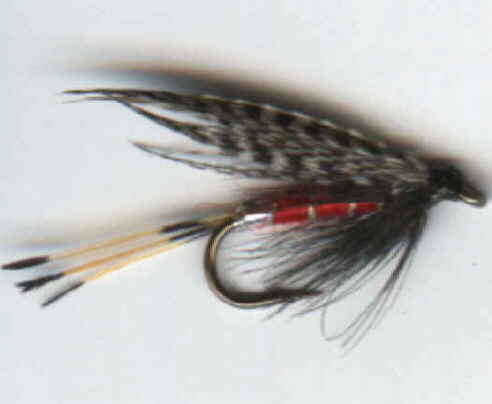 Tie in hen hackle infront of body. Make 2 turns only.